The Yemeni Foreign Minister, Hisham Sharaf Abdullah, called on the participants in the Conference on Humanitarian Commitments for Yemen held today in Geneva to work and cease all measures and practices that are part of the economic war against the Yemeni people. In his letters to the sponsors of the conference (Swedish and Swiss Foreign Ministers), the foreign minister called on not involving the economic system and the commercial movement in the political conflict, including preserving the value of the national currency and not to speculate it. He also stressed on the importance of the conference to come out with a summons to address the disastrous humanitarian situation in Yemen resulting from the Saudi war. Moreover, Sharaf demanded a fundamental solution by the immediate cessation of hostile military operations against Yemen and lifting the siege in all its forms. “The conference must result in outcomes that save the catastrophic humanitarian condition in Yemen due to the war waged by the Saudi-led coalition”, he stressed. “The forces of the coalition must not damage the neutral port of Hodiedah, which is considered to be the main lifeline for the passage of humanitarian aid and commercial goods to over 80% of the population of Yemen”, he continued. The Foreign Minister reiterated the position of the Republic of Yemen represented by the Supreme Political Council and the Government of National Salvation in adhering to the just and peaceful solution, and calling for a Yemeni-Saudi dialogue to put an end to the ongoing war and lift the 2-year air, land and sea siege, now entering its third year. 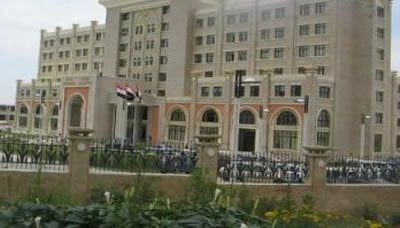 Sharaf affirmed that Yemen welcomes all efforts aimed at bringing peace, security and stability to Yemen, which had been devastated by the Saudi war and destroyed in a conflict that lasted for 24 months and is still taking place.